Sometime last week I was making dinner and wondering why it just felt different. Was I still easing my way into the new kitchen? Was I too lazy? Were the issues I was dealing with hampering my appetite? These were all legitimate and probable ideas, but then it dawned on me halfway through. Chris was out, coming home sometime, and I wasn’t exactly making dinner for us. I was making dinner for me, myself, and I. And he would stumble in sweaty from basketball, ask what pans I was using, and then make dinner for himself. Perhaps loving him made eating healthier, especially in the early stages, more enjoyable. I wasn’t nourishing my own body but someone else. I had another set of taste buds to please (or to wallow with me when I made a stinker of a meal.) Perhaps that is why I still regularly save a small spoon or fork full for him whenever I try out a new Thai-inspired sauce, which I’ve been doing quite often as of late. Part of me thinks I’m still showing off, but maybe I’m just trying to keep that small sliver of mutual satisfaction alive. So this epiphany, though bittersweet, has inspired me to add another dimension to living a healthy lifestyle. It goes beyond healthy eating, exercise, mental clarity, and self esteem. You got to do it from the heart. And I mean do it from the heart for someone else. Love yourself. Love yourself a lot. But don’t forget to love others too when it comes to working out (invite a friend on a run or to yoga class!) or trying a new all natural skin care recipe with a gal pal (there is always so much left over anyway) or, in the case of this blog post, cooking a meal for someone (only the Pope should have to eat alone.) This other person doesn’t need to be a lover. It can be an old friend, a new friend, a sick or down classmate/co-worker, or your parents. Even if it is once a week—or even once a month—try making a commitment to that person (or large group of people) to get together and cook for each other. I know I had tons of fun making cookies and sangria when the girls came over awhile back. The meals don’t need to be extravagant. Bring your seven layer dip, your favorite mixed drink recipe, or your mom’s perfect chicken marinade. There’s no need for a theme, or dressing up, or pomp and circumstance (unless you want all of those , in which case pomp away.) As long as you are surrounded by people you enjoy (people that will gladly help you wash dishes) then I think that is love enough! Okay, enough with the sap. You want a sappy black woman talking? Go watch Oprah, mmmhmmmm. 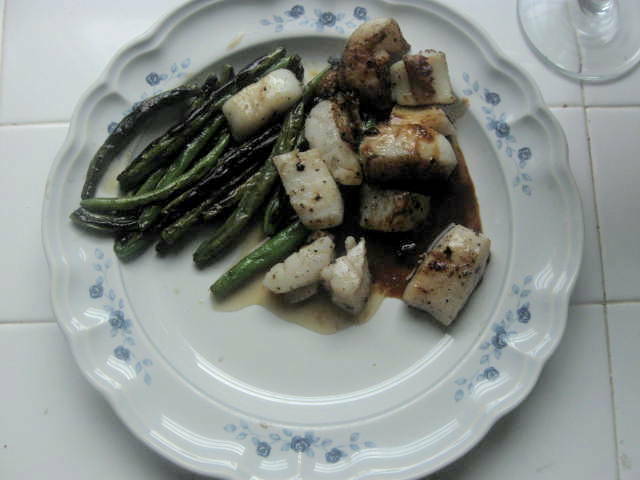 Here’s the recipe for the aforementioned Thai style meal: an orange-soy glaze over scallops. Where I shop a pound of large scallops (not the small ones) is $16.99 and that is probably on the cheap end. Check to see if your market sells scallop pieces, which I get for $7.99/LB! Your stomach won’t be the wiser, but your bank account will be much, much happier. Heat 3 tablespoons oil in large skillet over high heat. Sprinkle scallops with pepper blend and salt. Working in batches, add scallops to skillet in single layer; sauté until brown on outside and just opaque in center, about 2 minutes per side. Transfer scallops to plate, leaving drippings in pan. Add garlic and remaining oil to drippings in skillet; stir 30 seconds. Add orange juice, soy sauce, and orange peel. Boil until sauce thickens to syrup, stirring frequently, about 2 minutes. I served this with a plate of green beans covered in salt and pepper that I cooked up in the cast iron. Okay, I do admit this recipe might be the one you make with a LONG TERM significant other or a best friend that you’ve known for ages, you know the one that held your hair back as you puked. Why? This sauce is to die for. Like, lick the plate clean to die for—I speak from experience. Your besties or beau will love you (well, they might have a disturbed look on their faces), but the first date and new found friend might, well, not call you back for round two!